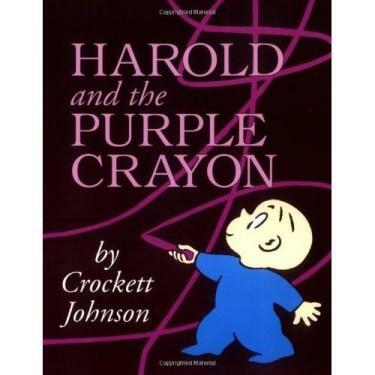 The book Harold and the Purple Crayon, written and illustrated by Crockett Johnson, was first published in 1955. It has since become a beloved famous kids' book, gracing the shelves of youngsters today. Seven books by author Crockett Johnson feature the character Harold. Crockett Johnson (1906-1975), best known for the Harold books, also authored several other books. He married author Ruth Krauss, and together they worked on several books, including the famous book The Carrot Seed.In an interview with National Public Radio (NPR), Where the Wild Things Are author Maurice Sendak reflects on Johnson's Harold character, about how much fun the child is and has in the story. This classic story continues to enthrall children, parents and other authors even today. With its simple yet vibrant illustrations and the magically woven storyline, Harold and the Purple Crayon offers a variety of activities perfect for young readers that spark their imagination and help with their reading skills. Even children who cannot read are able to do activities with Harold. Once the story is finished, have the children go on a "picture walk" of the book, telling you what happens on each story. Then, give them each a purple crayon and have them imagine where they would go if they couldn't sleep. After, have kids share their own pictures with one another. Older children can also write down a sentence or two to accompany the picture story. Have a cross-curriculum activity with the Harold book by teaching your child or students how to make crayons. Tour a crayon-making factory if you live nearby one. Alternatively, make a craft project in school or at home by melting old crayons into new ones in fun shapes and color combinations. KinderArt: Youngsters learn how to make purple shapes into a cohesive picture in this lesson. Scholastic: A discussion guide offers teachers and parents a starting point for talking about the book. Suggested activities for before and after reading the book are listed. The website LessonPlanet has an extensive listing of lesson plans for teachers that include Harold and the Purple Crayon. The lesson plans range from using Harold as a way to illustrate decision-making and problem solving to having students create their own story. Some lessons require membership; however, a free 10-day trial is available. Publisher HarperCollins offers free downloadable printables for many of their popular books. Find two Harold printables by scrolling through the alphabetical listings. HBO Family produced a 13-part series featuring Harold, narrated by actress Sharon Stone. While the series is based on Harold, the adventures diverge from the original stories by Crockett Johnson. The series is also available on DVD. Similarly, a Scholastic DVD collection featuring the purple crayon story, A Picture for Harold's Room and Harold's Fairy Tale is available as well. While not a substitute, the television program and DVDs are excellent supplements to one of the best children's picture books, the Harold book by Crockett Johnson, that continues to capture young readers' imaginations.